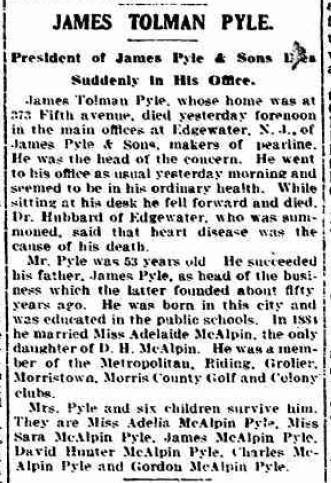 After sharing my great grand uncle's obituary last week (William Scott Pyle, 1856-1906), I realize that I have never shared the death notice for my great grandfather, James Tolman Pyle. 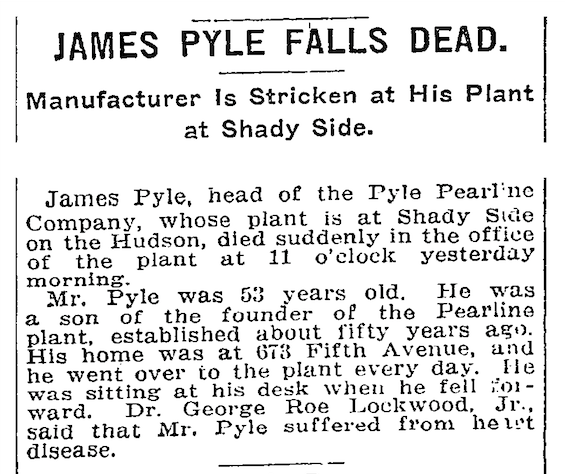 (His father, James Pyle, who died in 1900, had a long obituary in The New York Times.) He died suddenly, on February 8, 1912, the day before his 57th birthday, and just over six years after his brother, William Scott Pyle, died. On Ancestry.com, in the Historical Newspapers, Birth, Marriage, & Death Announcements, 1851-2003, I found a brief news story about his death in The New York Times on February 9. Ancestry.com, Historical Newspapers, Birth, Marriage, & Death Announcements, 1851-2003 (Provo, UT, USA, Ancestry.com Operations Inc, 2006), www.ancestry.com, Database online. His death notice is listed in four consecutive issues of The New York Times, from February 9-12. The February 11 issue includes a notice to veterans of the Seventh Regiment, N.G.N.Y. to attend his funeral. It looks like I need to do a bit of exploration into the N.G.N.Y. 7th Regiment, since both James and his brother, William, were members. At Old Fulton NY Post Cards website, I found a slightly longer obituary from the New York Sun, which has a few errors: his home was 673 Fifth Avenue, and he was 56 (almost 57) years old. New York Sun, New York, New York, online images (http://fultonhistory.com). Also at Old Fulton NY Post Cards website, I found another obituary from the New York Herald with a more dramatic description of his death. New York Herald, New York, New York, online images (http://fultonhistory.com). And now I know why I haven't been able to find a death certificate for him in New York; he died in Edgewater, which is just over the Hudson River in New Jersey. And New Jersey is not an easy state from which to obtain vital records. Y-DNA Test Results ~ A Non-Paternity Event?